Who may participate in the La Bella Baskets Program? 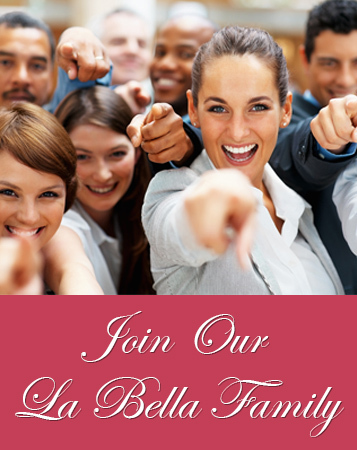 Any individual who is interested in making a formal commitment to promote La Bella Baskets programs in a structured way may apply to become a consultant. What if I don't have any experience? Even if you have never been involved in a gift business before, you will find the provided training to be easy to understand and simple to follow and implement. All the work has been done for you; just access the tools and go for it! La Bella Baskets will be with you every step of the way. We offer full support, guidance, and assistance from the beginning. Our training program thoroughly prepares you for your exciting new career with simple instructions geared to get you up and running in no time. Full support five days a week is available as well. You will also have access to our online community group. There you will be able to connect with hundreds of consultants ready to share great information and assist you. Our consultants have shown great success as soon as they've completed our training lessons. Our goal is to see you become successful and bring in the income you've always dreamed about! How long will it take me to get my business off the ground? La Bella Baskets provides you with full support and guidance from the beginning so that you can immediately begin your marketing campaign while building an impressive client list. Our consultants have shown great success as soon as they've opened their doors. Setup is easy for you since our experts have done all the legwork necessary for you to get started and succeed without having to worry about the details of establishing a business from scratch. Our goal is to see you become successful and bring in the income you've dreamed about without undue stress or hassle. How do I promote the program? Can I track my customers online? Yes. You will have access to a back office that you can login to check your earnings and sales. As a La Bella Basket Consultant, am I considered an employee of La Bella Baskets? No. As a consultant, you are an independent contractor and not an employee of La Bella Baskets. Are taxes taken out of my check? No. You are an independent contractor and no taxes are taken out of your twice monthly commission checks. You must file Form 1099-MISC (Miscellaneous Income) to report any income of $600 or more. Does La Bella Baskets reimburse me for any ongoing expenses of promoting the program? No. As a La Bella Baskets consultant, you are responsible for all of your own expenses. You are paid a commission based on finalized enrollments and sales. How do I keep track of how much money I'm making with your program? Every time a gift order is placed through your website, your back-end control panel keeps track of it. Just check your control panel daily to track your gift sales and commissions. What if I have no sales experience? It might surprise you to know that most of our successful gift consultants have never sold anything before. If you love gifts and helping people save money, you can do this business! Do I have to design my La Bella Baskets website? No. Your website will be created as soon as you enroll. Just about everyone we meet are gift-givers. This includes your friends, family, school friends, and local businesses. We will also teach you internet marketing techniques so you can market your website on the internet. Gift baskets and personalized gifts are also perfect for corporations, hospitals, car dealerships, funeral homes, stores, and other business enterprises. Personalized gifts are desirable for any person wishing to give a memorable gift to someone special, a client, or anyone else. We never have trouble finding clients to buy our gift baskets or personalized gifts. After all, who doesn't want to deal with a company that ships or delivers the perfect gift every time? Do I have to package or ship products? The wonderful thing about La Bella Baskets is that you do not package or ship any items - we do it all for you. Just submit your order through your website and we take care of the rest! Your customers may pay by credit card. We accept Visa, MasterCard, Discover Card or American Express. What is La Bella Baskets responsibility to you? Our job is to supply you with the gifts you need and to make sure the gifts are shipped to you in a timely fashion. We will ship directly to you or your customer. Our job is also to provide you with all the necessary tools to become a successful gift expert. What special qualifications do I need to start this kind of business? There are no special qualifications necessary. All you need is a passion for helping people with their gift needs, the ability to follow directions, and the desire to work for yourself. How much start-up money will I need? Not much at all. Our program tells you how to generate business at no initial cost at all. Of course, once you begin generating money, you can reinvest it and grow your business even more. Our company requires a small overhead of $24.95 a month, which covers your LBB membership. La Bella Rewards Program: Get cash back on over 1,000 of the best-known stores in the country. Stores such as Macy's, Target, Best Buy, Wal-Mart, and More! Receive access to exclusive deals: Get savings up to 80% off! 1,200 - 2,500 hot deals and promo codes daily! Online printable coupons: The ultimate way to save money on your groceries with access to the most comprehensive bundle of available grocery related benefits. Immediate print-at-home coupons from the 4 top internet coupon clipping sites all under one roof. What if I've never had a business of my own before? Then it's time to get started! We provide you with everything you need to make your business a success. How much money can I expect to earn as a La Bella Baskets Consultant? While the earning potential associated with La Bella Baskets is open-ended, it is impossible to guarantee that a particular level of income will be earned. The amount of money you may make as a La Bella Baskets consultant will depend upon many factors, including your personal goals and the amount of time and effort you choose to invest in your business. Many La Bella Baskets Consultants operate their businesses on a part-time basis with an objective to meet short-term financial goals like paying for holiday gifts for the family, a family vacation, school supplies, or tuition for their children. As with any business, there are no guarantees or assurances that any level of sales or income will be attained. The main thing to remember is that how much you earn with your La Bella Baskets business is strictly up to you. What are the sales and marketing approaches that will help me achieve the most success with the La Bella Baskets business opportunity? At La Bella Baskets, we have a great variety of sales and marketing tools, such as free business card samples, free marketing material, newsletters, and online information. Consultants can access a diverse selection of training that is available on our training website. We have found that the most successful La Bella Baskets Consultants approach sales and marketing using all the tools accessible to them and by consistently using their own good judgment about sharing the vision with a loving heart and caring spirit. Can I cancel at any time if this business is not for me? Yes. If you decide this business is not for you, simply notify our banking & credit department at bankingandcredit@labellabaskets.com (Monday thru Friday 9 am - 3 pm Eastern time) and your account will be canceled with no future obligations. You will receive a confirmation when your account has been canceled.